There are currently 1 user and 1629 guests online. anyone else having issues with Fishranger? on my PC it wont load and i get the number 7721 in the top left corner of hte page, on my phone it says soemthign about request failed. ite been like that for 4 days i think? is it just me? I know its been under construction and big changes in prepartion for the new functionality of the website, which were recently publically funded. I'd contact them direction on email or facebook. (support@fishranger.com.au). Mine still appears to be working on Chrome. Any feedback helps this process. I was one of the backers for that project, can't wait to see the site up and running. Time Machine feature – so you can look back to any day (since 2015) and see what the weather was. This lets you analyse your past fishing trips and look for favourable weather patterns. Here is a development release of the new 10 day wind chart with second GFS wind chart underneath it. These models have different model physics and are produced by different agencies so are arrived at through totally independent means. If there is consensus between the models you can have a high degree of confidence those conditions will prevail. Another backer here. I'm not yet convinced of the GFS forecast. Seems to suggest lighter winds than BOM and BOM seems to generally be on the money. Happy to be educated though. BOM is paid for $$$ and therefore no one uses it. BOM can be more erratic too i've noticed with trying to be more accurate and sometimes can throw you off on the day of planned fishing. Ideally its meant to mean that the granularity of the forecasts are better. ......turns out it was me, my router wasnt letting me access certain (a lot of) sites, only work ones! But of late, I have become a firm believer in Windy.com. After being put onto it by a local wetliner, who has been using it closely most of this year ( and he was put onto it by Whitey) , it has so far proven staggeringly accurate. Far, far better than anything else I have ever used, and believe me, after making my living off the ocean for many yers, then going recco after that, I've tried 'em all. It gives a choice of two different forecast models, the GFS mentioned above and the ECMWF, which comes up as default. I've been using the default ECMWF , find it here www.windy.com/ Do yourself a favour and give it a go. The incredibly useful part about it is the animation of wind directions and the pressure areas that influence it , both locally and globally. Look at it and you will start to understand why wind acts as it does. Zoom in for very localised forecasts. as an example--anyone here ever fished Exmouth Gulf in the warmer months? Wonder why it can be a westerly in the gulf and fresh ssw westside. or why you get the glass-offs, and why the Learmonth forecast and observations can be pretty useless for up past Exmouth Reef? Just look at the animation, see the low form up over the Gulf during the day, and see the wind rotations. Brilliant stuff. You can also overlay actual weather station observations on the map as well. We were coming back in from the Gulf last week, 15 mile from the marina light nor-wester, obs at Learmonth showed a 17 knot SW. Looking at the animation ( on my phone) you could see the low moving up, dragging the wind behind it. I predicted we'd likely hit the SW about 5 miles out, and it was spot -on. True, but its all about putting your marker in the right location (eg. I use 60m mark or Deep drop mark for fishranger) to get right forecast for where you are fishing. Windy i agree good for visualisation and understanding of whats occuring, but still uses global models which are are less granular. I prefer apps like fishranger/bouyweather which are intended for boating as well to determine the seas in pinpoint locations, as this is what really matters. Considering windy uses wavewatch (another global model), this is also not as accurate as local data. I then collaborate this sea forecast with live seas and swell data from rottnest transport page, to determine the most accurate forecast. if you click on a point (desktop) , it will give you are wind speed and direction forecast at that point. In the app, tap on the point then move the picture around to get the part of the picture you want for forecast under that point. You are not stuck with a pre-determined point. I know Fishranger uses a grid system, but, for example, the two Kalbarri points, inshore and offshore, usually say the same thing, when I know for sure they won't be. That was my big disappointment with Fishranger. On the other hand, Windy shows those variations much more accurately, at least in the time I'm looking at it. And the ECMWF has always been more accurate than BOM or GFS, again, in the time I've been looking at it. As to it being a global model, less granular?--I've found it extremely granular, amazingly so. The modelling that BOM, et al, are using is only a part of a global model, anyway. 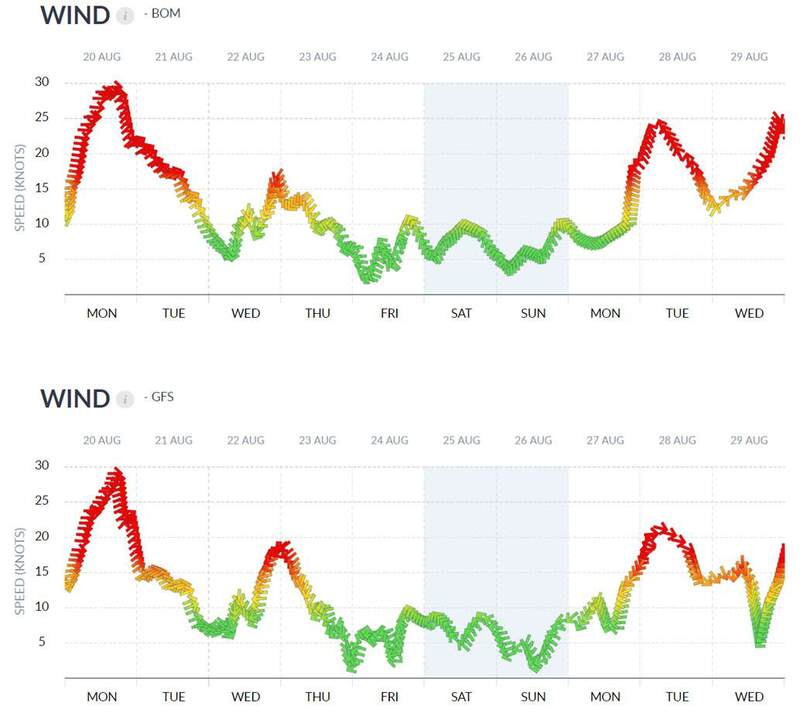 The wetliner I referrred to has the shore-based guy looking at the app, and talking to the blokes, offshore, actually in it, and the actual vs the forecast is normally very close. Trust me, i'm very good with technology and I use the app very well, and receive customised alerts regularly to my email. I would be careful with your use of the word "accuracy" here....i can certainly (without a doubt) say windy is less "accurate", though it may not be right in all cases....who really can predict weather 100%??. Just because its a nice pretty colourful graphical representation, doesn't make it more granular or "accurate". It comes down to the methodolgy and data used. BOM is more localised and detailed mesuring points to interpret forecasts. I will certainly trust data and forecasts that are more granular, specifc to a region. Its almost like asking someone from america about where the fish are biting in Perth....i know where i'd be taking my tips from, the local fisherman, not the US. If there's a problem with locations, ask for a new point to be created for a specific region. As i mentioned before, i'm more interested in seas than wind. Windy seas 50km range vs 3-6km...i think i'll take the 3-6km "accuracy". The input data resolution is the granularity that matters and it what determines the accuracy of a forecast. The input data resolution is more granulated on fishranger than windy. That is different to granularity in the sense of zooming in on windy, which is just interpolating the lower accuracy forecast to a more specific region. Although the visualisation of windy is great.